Karoo looks set to upgrade all of its customers from ADSL based connections to ADSL2+ over the next two months according to the broadband providers service status page. "15-07-2008 09:53:29 - Karoo network upgrade During the next two months we will be upgrading our broadband network to ADSL2+, the New Generation of Broadband services. This will mean faster, more stable broadband connections for our Karoo Lite, Mid and Pro customers. We will be carrying out the work between midnight and 7am to reduce any inconvenience to customers. The work will be carried out in two phases, during the first, some customers may experience a short interruption of no more than 2-3 minutes to their broadband service. During the second phase, customers may experience an interruption of up to 45 minutes while the upgrade takes place." Broadband customers in the Karoo area on average have slightly shorter phone lines compared to the UK average for BT lines, so the improvements under ADSL2+ may be even better. 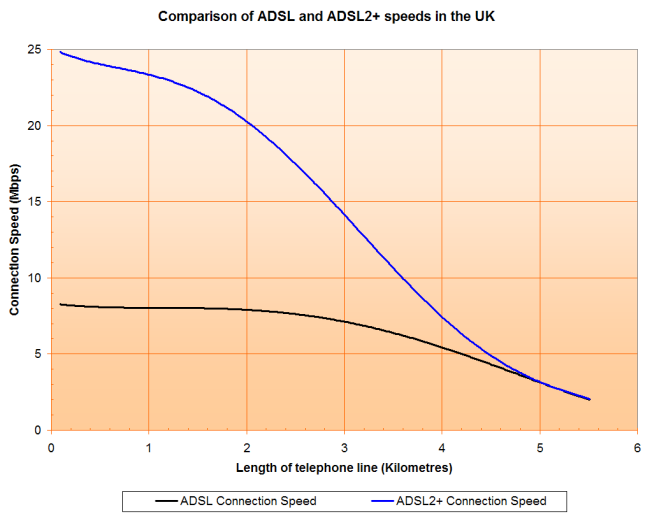 A very rough guide of the potential speed improvement can be estimated from the graph we published some time ago, for example a 4Mbps ADSL connection may connect at around 7Mbps under ADSL2+ and a 7Mbps ADSL connection improve to 14Mbps. Karoo offer three consumer broadband packages, ranging from 2GB of usage for £8.49 to £29.99 for a 75GB allowance (unmetered from midnight to 8am). Though the footnotes do indicate that even if inside your usage allowance, peer to peer and Usenet (newsgroup) traffic may be restricted at busy times. If this goes as well as the current migrations which are being described in the entanet forum then this might be construed as a threat rather than a promise. Just a quick correction to your comment "upgrade all of its customers" - the only existing customers who will be upgraded are those who have upgraded to the new packages. Existing customers are being rewarded with nada unless they take new contracts out. The basic package charges £30 "connection fee".